MNGPad is a program written by GreenReaper for creating and editing music in the MNG format for Creatures 2, Creatures 3 and Docking Station. 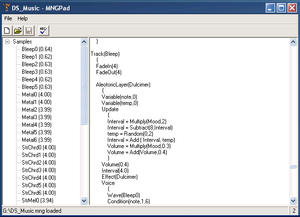 This music can be played in its sister program, MNGPlayer - these are packaged together as part of the MNGEdit project. It requires the .NET Framework from Windows Update to be installed first. MNGPad has been reported to have errors when used on Windows 7 and more recent OSes. This page was last modified on 20 May 2018, at 21:48.